I’m a Dad blogger, for Christ’s sake! You simply do not F*** with the bedtime routine. No way, no how, don’t do it! It was your standard Wednesday evening. I got home in enough time to dump the car at the house, pick up the dog and my son’s bicycle, and then walk to the childminder. It was rather spectacular, an absolutely huge bright yellowy ball just above the rooftops. An idea started to form in my head. A wild idea. A very very silly idea. When we got home, my wife had returned from work and started the dinner. I tentatively broached my wild idea with her, knowing that she often thinks I try to “overstuff” our lives. This time, however, she thought it was a lovely idea. Yes. 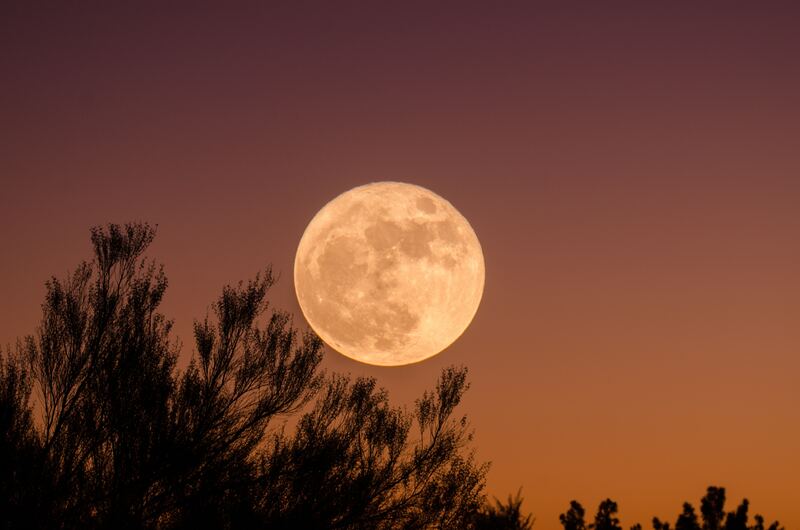 We absolutely should bundle the kids into the car after dinner and drive to the top of the local country hill to observe the Supermoon in its raw and non-lightpolluted glory. She, of all people, should have known better. She’s “the sensible one“. She could have saved us right there and then. But no, seduced by the Supermoon, 5 years of MadMumSkillz went out the window! With buy-in from the Matriarch I moved on down the hereditary line. Next was my son, who was reclined on the sofa watching Paw Patrol. It seems that when faced with the “Supermoon instead of Paw Patrol” dilemma, he’d be choosing Paw Patrol. I explained that it was after dinner and it was a “Supermoon instead of bathtime” dilemma, and he was now significantly keener. My daughter was a much easier sell. She wouldn’t sit in her chair. He would only slowly pick at his pasta. We forgot we were meant to Facetime the grandparents. Children were fading, my commitment to the Supermoon was waning. A vision of us as a family, hats and scarves on, standing beside the 13th Century windmill on top of the hill, my wife telling tales of explorers like Neil Armstrong and Yuri Gargarin, me pointing out Orion and trying to remember any other constellation. The kids standing in awe of the incredible celestial sight in front of us. It took 20mins to get the coats and shoes on. 10mins to find the stuffed polar bear who, my daughter insisted, DESPERATELY wanted to see the moon too. 5min to explain why the dog wasn’t coming with us. Finally outside, I loaded my daughter into her car seat. Immediately I could smell that something wasn’t right. It was too late now, we weren’t going back inside. I’d have to gamble it was just post-pasta wind. By the time we’d pulled out of the driveway my son was in tears. My daughter was in tears. My hands were clenched on the steering wheel. My wife was laughing, you know, one of those gallows laughs. Or maybe one of the laughs that rattles around the corridors of insane asylums. Increasingly I struggle to tell the difference. We got to the top of the hill. My wife negotiated my son out of the car, I lifted my daughter out. The smell had not dissipated. We were sans nappy bag. I must admit it was pretty windy up there. Pretty bracingly cold, and windy, in January, in Oxfordshire, who knew?! My daughter removed her hat and gloves. Finally, we made it to the Windmill and the kids stood and pointed at the Supermoon. The “Supermoon”, which had now risen in the sky, had also noticeably shrunk and was back to being a normal sized moon. A bit brighter perhaps, but definitely an average white moon size. Learn from my mistakes folks. Don’t ever, EVER, mess with the routine. Not for a Supermoon, not for Santa Clause, not for nothing! I wanted a wonderful unique family memory. They wanted bubbles, stories, and bedtime cuddles. Our childminder once said to me that kids only remember that happens as soon as they wake up and just before they go to sleep. I’m sure she was only saying that to alleviate my guilt of leaving the kids with her for 9hrs out of the day. Maybe she had a point. I don’t remember much of my younger days, we got to go to Disneyland and Eurocamping but, much to my parents chagrin, I hardly remember the details. I do remember my dad reading me stories though. I remember begging him nightly for just one more chapter. I remember him skipping ahead to see how long the chapter was. I’m not saying this evening would have been a specifically memorable evening of stories for my kids. And, to be fair, the Supermoon probably will be memorable for them, in that same way that the brain compartmentalises trauma. But I do think that next time I figure I can “win” at parenting with one grand gesture of inspirational fatherhood, I might do well to recall that it’s the ongoing love and effort they remember and, for my own sanity, not to disobey the golden rule of parenting. Never F*** with the routine!